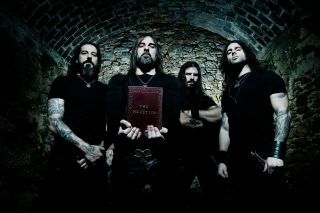 Due to charge, gladiator-like, out of the Season Of Mist catacombs on February 15, Rotting Christ’s 12th studio album, The Heretics, is set to become another landmark in a 30-year career that’s seen them journey from the darkest corners of the black metal scene to the status of rabble-rousing, tribe-uniting festival headliners. Epic in scope, irrepressible in its heart rate-ratcheting mastery of groove and as devastatingly expansive as an erupting volcano’s pyroclastic flow, The Heretics harnesses the rebellious nature at the heart of heavy metal as it celebrates challengers of the status quo throughout the ages, from defiers of Christian orthodoxy through to French philosophers and American political theorists, all with enough exhilarating sonic mass to overturn a temple. We have a special preview in the form of a visually stunning lyric video for the closing track, The Raven, dedicated to Edgar All Poe’s famously foreboding poem and one of the most referenced works of literature in the metal world. None of which will prepare you for the rapt, aorta-bursting riff that runs through the song’s core, the imperious narration and heavens-parting atmospherics of the song itself. It’s all accompanied by elegantly gothic visuals of forests, abandoned mansions, apprehension-inducing statues and a full moon full of portent, so tread carefully across the threshold and give yourself over to the towering grandeur of The Raven below! And pre-order The Heretics here!